The three licenced dive operators in Sogod Bay travel to these areas during the whale shark season. Normally they need at least 4 persons to make the trips this is also subject to weather. The water visibility is normally around 15 to 20 metres which is superb for photographers. (note alot better than Donsol). This time of year the water temperature is around 25 to 26 C so I would suggest divers bring 5mm wetsuits if you feel the cold. The locals at Sunok, San Ricardo and Limasawa have organised whale shark spotters. Which the dive operators use while finding the whale sharks. The spotters have a fair idea where the sharks will be and guide the dive operators with their guests to them. The local authorities have set up fees for these services. In September 2008 a new ordinance was pass by the local authorities within Sogod Bay only allowing snorkeling and Strictly No scuba diving with Whale sharks. 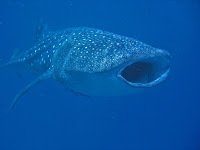 In 2009 and 2010 the whale sharks appeared in Limasawa Island we had alot of sighting probably the best season yet. Hopefully 2010/2011 season will be a good one too.